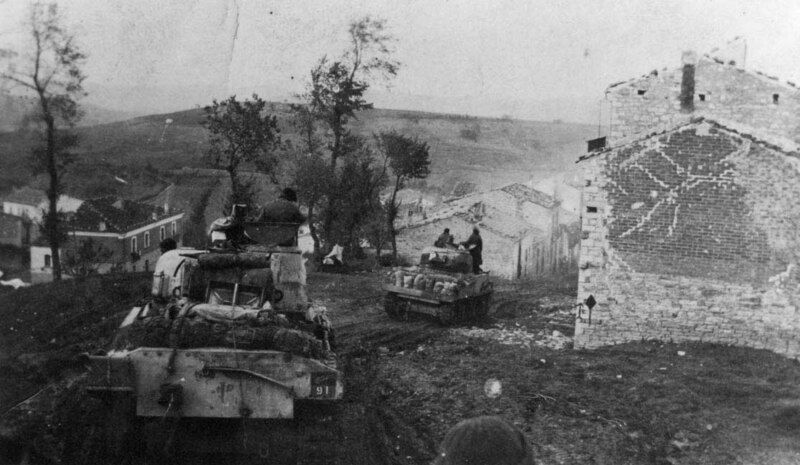 Tanks of 18th Armoured Regiment approaching Guardiagrele in November 1943. The tank in the foreground is notable for having very little in the way of stowage on the back plate. The combination divisional insignia – unit serial patch is displayed prominently instead. 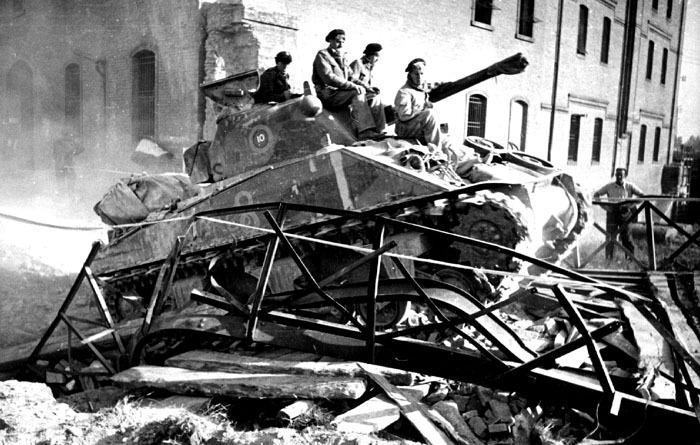 A Sherman III from 19th Armoured Regiment during trials with grousers in early 1945. 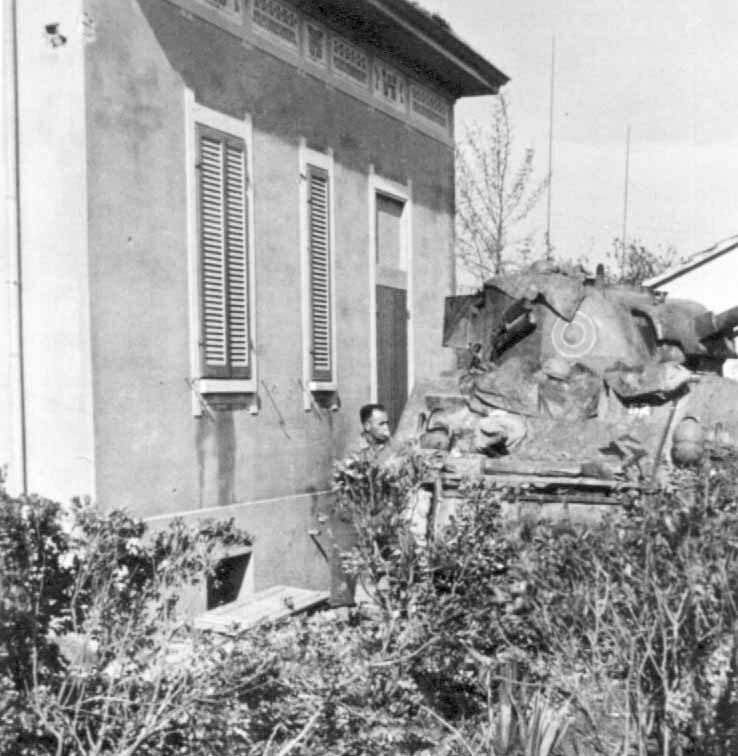 A Sherman III of 18th Armoured Regiment in Italy completed in the standard early scheme of mud grey overpainted with patches of blue-black. The tank number is in the standard unit pattern of red with a white 'shadow'. 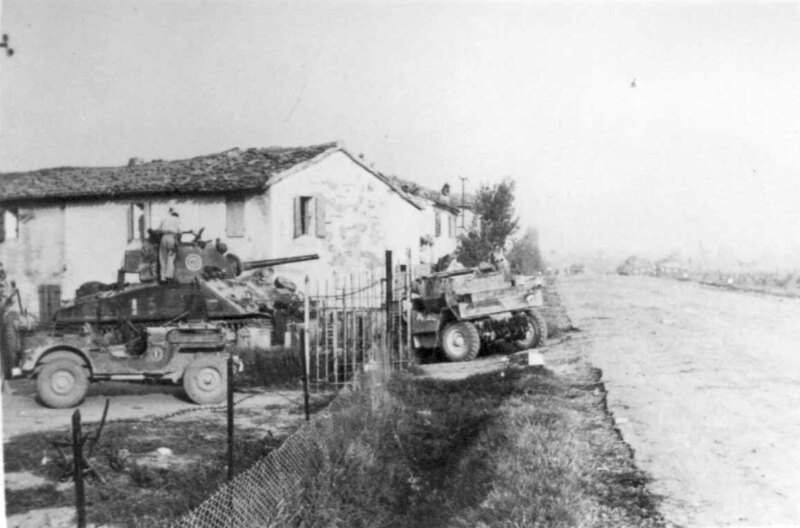 9 Troop, of C Squadron, 19th Armoured Regiment in position on Route 16 south of Rimini airfield on the 18th of September 1944. 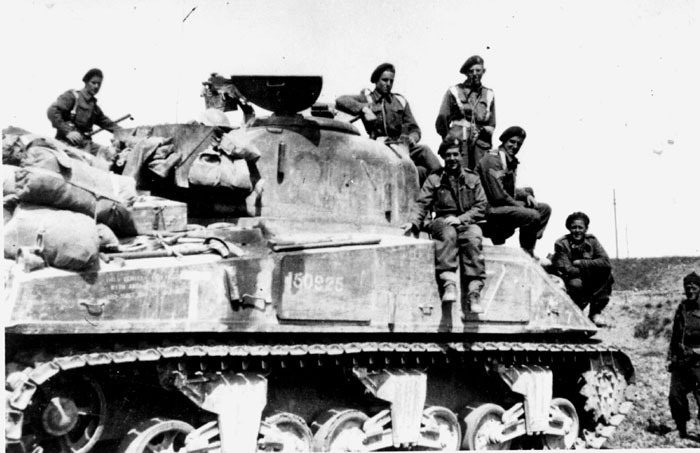 Ken Brown's Sherman III, C Squadron, 19th Armoured Regiment in the Liri Valley, 17th of May 1944. 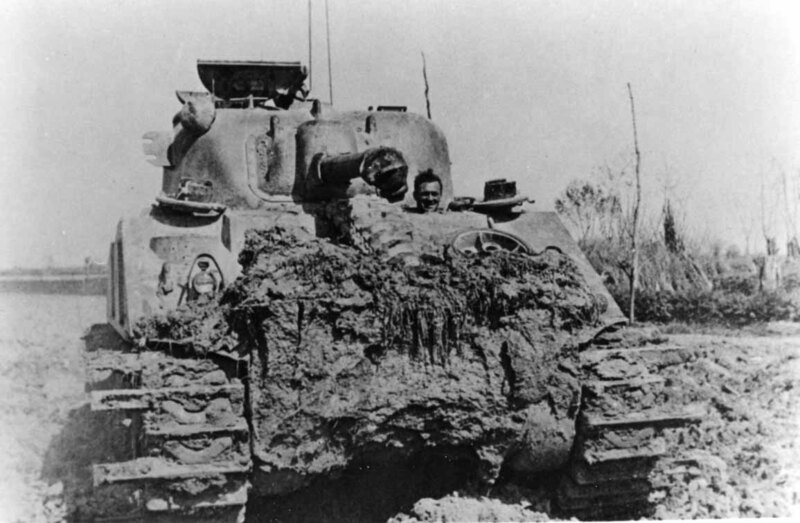 Rex Causton and his Sherman III from C Squadron, 20th Armoured Regiment at Bellaria, October 1944. Note the white outline around the turret insignia and the unit serial on the driver's front plate. 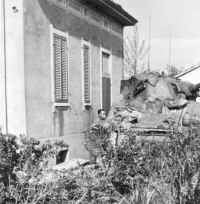 A 17-pounder Sherman from C Squadron 20th Armoured Regiment during final drive through the Po Valley. This is the VC version of the tank. Note the countershading under the front half of the barrel. 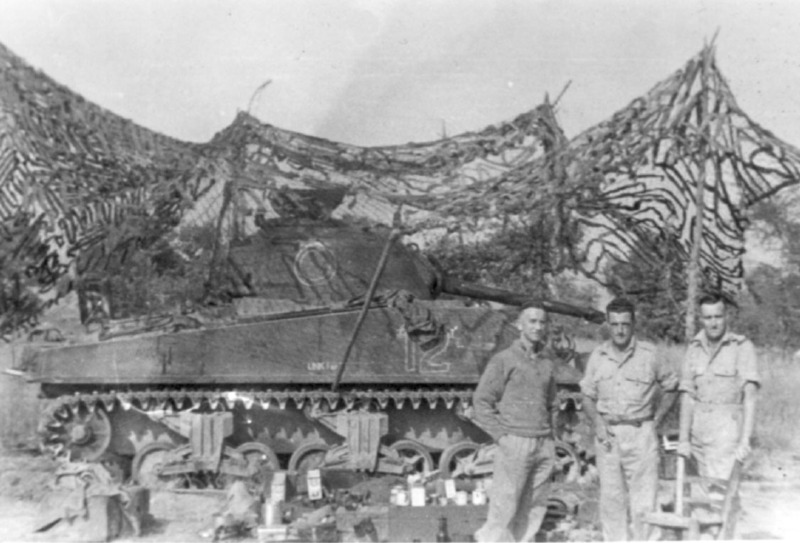 A M4A2 Sherman under a camouflage net around the time the units were at Cassino. 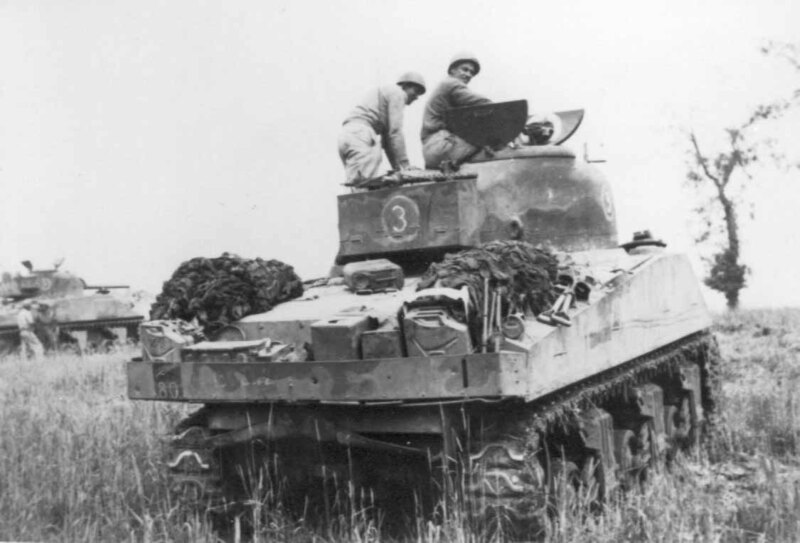 The outlines to the Squadron insignia and the vehicle number suggest that this tank is from 20th Armoured Regiment. A C Squadron Tank of 18th Armoured Regiment waiting to cross the Po River. Vehicles of this regiment were notable for employing this particular style of hull callsign number, presumably in the unit colour red with a white shadow behind. The unit serial number was 91. A Sherman crossing a bridge somewhere in Italy in 1944. 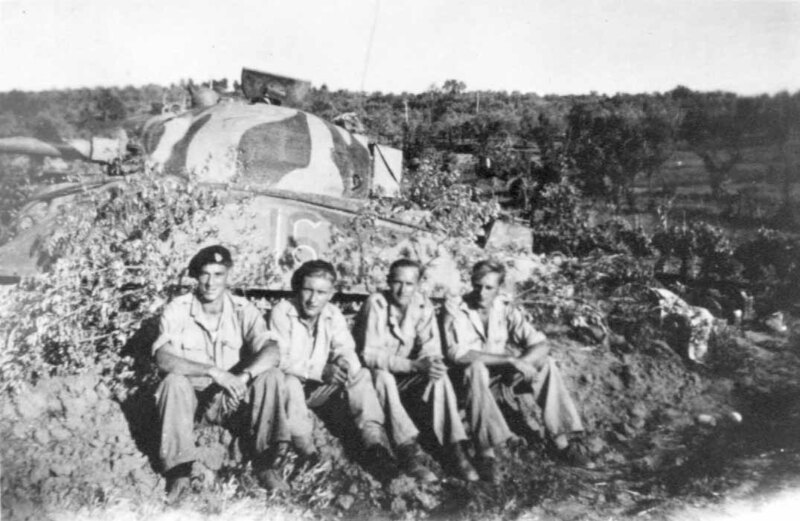 The unit is unknown but believed to be 19th Armoured as C Squadron from this unit appears to be the only ones to have also painted the Troop number inside the squadron insignia. This being the case the squadron insignia would have been yellow and the troop number white. 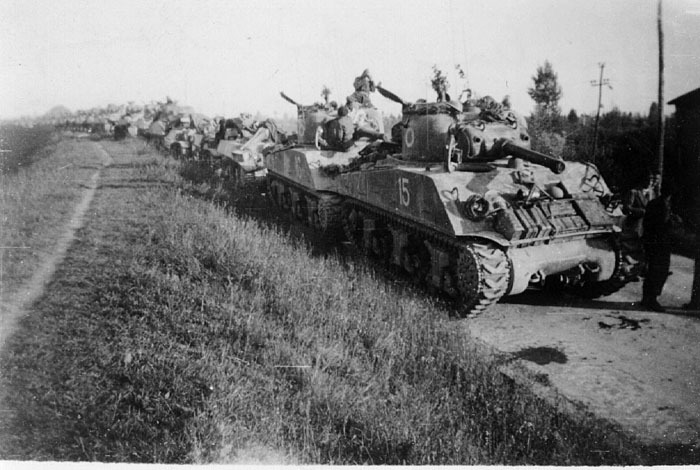 The unit serial for 19th Armoured was 80. 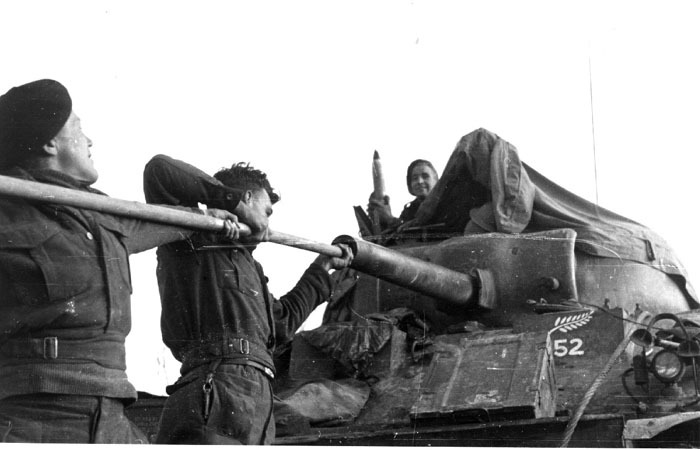 A crew of a 20th Armoured Regiment Sherman cleaning the gun barrel while the unit was stationed near Faenza in December 1944. In the Italian campaign the unit serial patch and divisional insignia were combined and usually painted on the transmission housing inside the unit serial patch colour, but there are always exceptions. 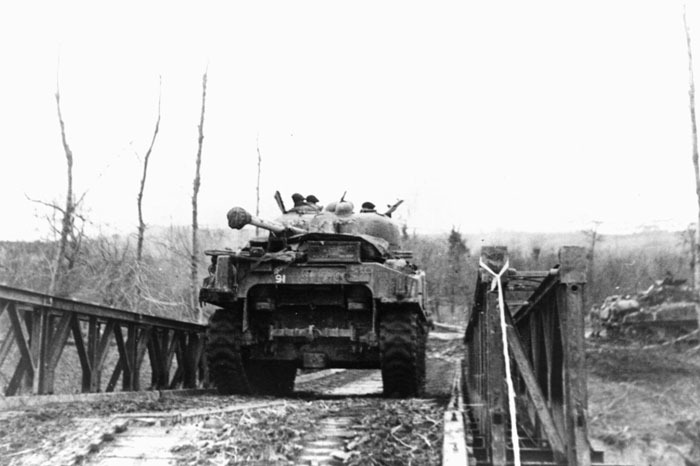 A Sherman IC Firefly of 18th Armoured Regiment crossing a Bailey Bridge in Italy in 1945. Note the use of counter-shading in white under the front half of the 17-pounder barrel. 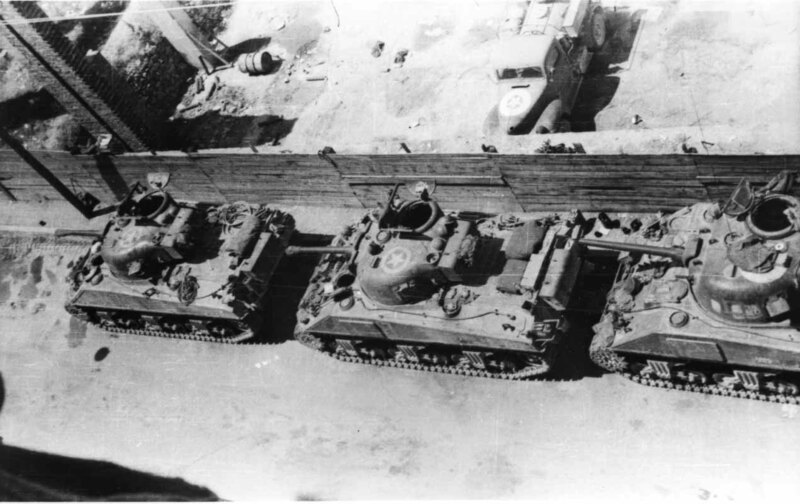 A line of Shermans C Squadron 20th Armoured Regiment during the final advance on Trieste in April 1045. 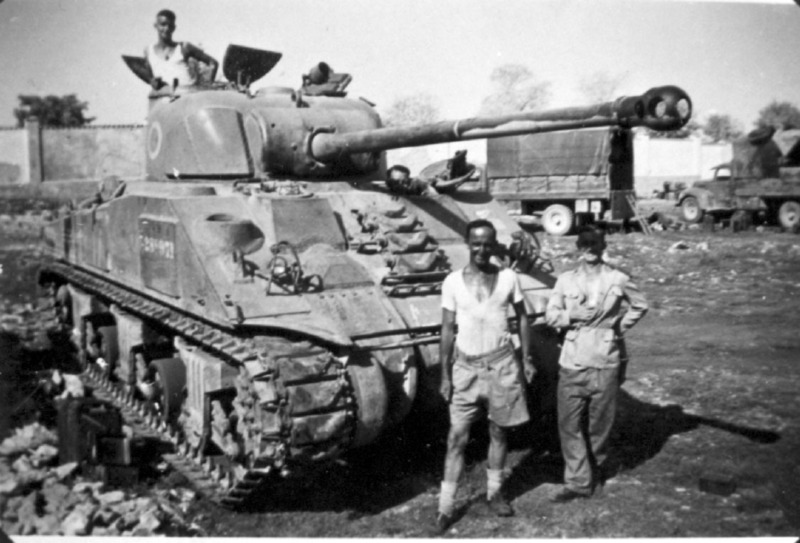 The lead tank, a M4A3 105 mm was commanded by Major Moodie, OC C Squadron. By this stage of the war the command tanks in the Squadrons tended to use the higher numbered call-signs.